(PhysOrg.com) -- The introduction of species like "Frankenfish" or "Rock Snot" into Pennsylvania waters doesn't sound pretty, and it's not. These are just two of the more colorful nicknames for aquatic invaders, but the innocent-sounding ones -- such as parrot feather or water chestnut -- also have the capacity to spell doom for some local ponds and streams. "An invasive species is something that didn't get there on its own, and it causes harm," said Diane Oleson, extension educator from York County. More specifically, it is any plant, animal, insect or disease pathogen that comes from outside of its native range, is brought in by artificial means and causes economic, ecological or human health harm, she said. While notorious invasives such as giant hogweed, mile-a-minute vine, gypsy moths or emerald ash borers have clearly decimated parts of the above-ground landscape, their water-borne counterparts have been wreaking havoc in and around Pennsylvania ponds, creeks, lakes and streams. Lake Erie already has been overrun with the zebra mussel and the round goby, and the threat of Asian carp spreading is foremost on the minds of every state bordering one of the Great Lakes, because it would threaten native fish populations and could potentially destroy fishing and tourism industries in those states. 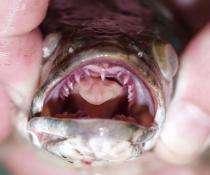 Rivers in the Northeast are seeing a sharp rise in Northern snakehead, a toothy predator resembling a pike. Snakeheads breed prolifically and out-compete native fish for food and habitat. Snakehead earned the nickname "Frankenfish" because its unusual respiratory system allows it to live outside of water for several days, so long as the fish remains moist, Oleson said. Being a "fish out of water" poses less of a threat to snakeheads, because they can wiggle across land to a new water source where they can spread and naturalize. "Our efforts are aimed at education, because prevention is the best weapon we have against spreading these things," she said. One of the best strategies, according to Oleson, is to understand the pathways of introduction for various invasives. Sometimes the pathways of introduction are paved with good intentions. Well-meaning pet owners may not wish to destroy an animal that has gotten too big to keep, and they may turn it loose in the wild, not realizing that the introduced species has no natural predators in its new habitat. "Lionfish off the Atlantic coast and Burmese pythons in the Everglades are doing just fine, thank you very much," said Oleson. Snakeheads may have been spread through the aquarium trade, she noted. Young snakeheads are available at pet stores, and if the fish get too big for a tank, they may be dumped inappropriately. Certain plant materials, such hydrilla, parrot feather and yellow floating heart also are sold as ornamental plants for aquariums or water gardens. "They're fine when they stay in the water garden, but they're not fine when they get out," she said. Snakeheads may have been introduced from the live seafood trade. "Some people believe if you eat something, then you need to return something to nature," Oleson said. "These fish had been bought for eating, so if they don't eat them, they release them." Newly introduced species get a breeding population started, guard their young and are very efficient predators. Unchallenged, these snakeheads get up to 3 feet long, she said. Other introductions are less intentional but equally devastating. Microscopic life forms may survive in boat bilges, on hip waders, in nets, on anchor lines, in live wells and even in the fresh water that circulates in an outboard motor to cool the engine. Oleson recommends thoroughly cleaning and drying a boat before leaving a watershed. This includes policing boat bottoms and trailers to remove any water weeds that may be carrying zebra mussels. Oleson cautioned anglers not to dump leftover live bait into a water body, saying that young fish pretty much look alike, and there may be fish or crayfish in the mix that are native to somewhere else. "Check your anchor lines and make sure those are dried out," she said. "Don't move bait. If you have extra bait, don't dump it in the water, dump it onto the land -- and bury the dead fish." Plant life can be just as aggressive as members of the animal kingdom when it comes to dominating an environment. "Invasives are the weeds of the world," she said. "They are very tough, and they adapt to a wide range of conditions. Native plants grew up together and play nice. Invasive plants don't support succession, so when they come, they come without their predators, parasites, diseases and outside means of control -- so there's nothing really to stop them." Invasive plants such as purple loosestrife colonize the banks of waterways and eventually force all other species of plants out. Aquatic plants such as hydrilla or water chestnut form dense mats on the water's surface that will cut off oxygen and light to anything underneath it, threatening the existence of fish, plants, insects and anything else beneath it, Oleson said. Rock snot is the nickname for didymo, a microscopic diatom that produces long tubes of material that resemble wet, slimy wool, according to Oleson. The organism spreads all over the rocks in the stream, and it crowds out what should be on the stream bottom, posing an ecologic threat that grows so profusely and thickly that it crowds out other forms of algae. Those native forms provide the basis of the food chain for tiny fish, crayfish and insects, which in turn feed other species. Rock snot actually was native to colder waters in North America, but something has shifted in its proliferation, she said. It used to be found in cold, poorly fed streams, and now it overgrows stream bottoms in warmer areas. Rock snot is transmitted largely by fishing gear, particularly felt-soled boots. Experts recommend washing and thoroughly drying any fishing gear and apparel before bringing it into another body of water. Humans, Oleson warns, are the only reason some invasive species are spread. "They can't walk and they can't fly, so humans are the main vector. This is why education is so important. Right now there is no good control, so best control is prevention," she said. I'm designing a net for the front of a noisy boat that will funnel the flying carp into a live well. They're good to eat, and the economy is failing. Protein is important. Same thing with kudzu. Imagine getting paid to harvest it! It was introduced as animal feed. Educator Oleson is correct that invasive wildlife is a major problem that needs to be addressed. However her claims against the Snakehead fish are from reading inaccurate reports. Snakehead fish do not out-compete fish native to the United States. There is more than enough evidence to refute these claims. In Japan imported Bass and Bluegill hammered Snakehead fish populations. Pennsylvania Park officials have seen Bluegills securing young Snakeheads for food despite effort of parent Snakehead fish to protect their young. Fishermen have reported Bass out-maneuvering Snakehead parent fish to obtain a meal of young Snakeheads. In small enclosed ponds, Snakeheads may be useful in preventing Bluegill, Crappie, and Bass populations from stunting or over-populating but Snakehead fish would probably lose all their young to the other fish.